How many bookmarks or favorites do you have in your Internet Explorer,firefox and Opera web browser ? more than 100 ?Is there any dead link in your bookmarks ?If you checking one by one,it will be tedious job for you to complete all the bookmark in your web browser.Now,please using AM-Deadlink to help you. 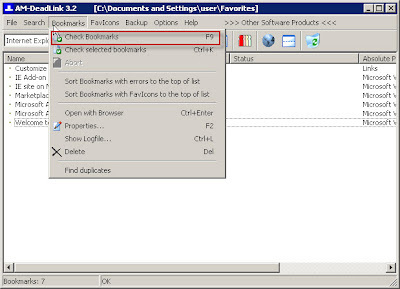 AM-DeadLink detects dead links and duplicates in browser bookmarks and text files. If a bookmark has become unavailable you can verify and delete it permanently. Download AM-DeadLink 3.2 and install it.then select the web browser that you preferred and press ‘F9’ ( check bookmark) . Then you can delete the bookmark that showing you error message.It is fast and easy. AM-DeadLink is a freeware and supports Win9x/Me/NT4/2000/2003/XP/Vista .